Who doesn't want a beautiful smile? A healthy, attractive smile has a hugely positive effect on your self image, and we all know that when you feel good about yourself, you reflect that confidence to those around you. The way you carry yourself and the impression you make can do so much for your quality of life. The world of cosmetic dentistry today makes it simple for us to correct, improve, and replace teeth that are stained, chipped, crooked, missing, or separated by gaps. Nice Smile With Whiter Teeth! You Too, Can Have A Beautiful Smile! What's especially great about today's advanced technology and quality materials is that we can see these changes happen relatively quickly, without the hassle and pain of orthodontia. 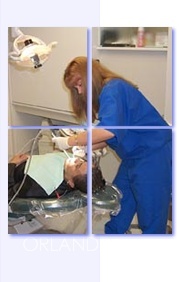 In fact, cosmetic dentistry is probably much simpler, more accessible, and more affordable than most people realize. What's more, cosmetic dentistry doesn't limit itself to the very visible teeth, but can improve back teeth as well. Unattractive silver fillings can now be replaced with more natural-looking materials that blend better.